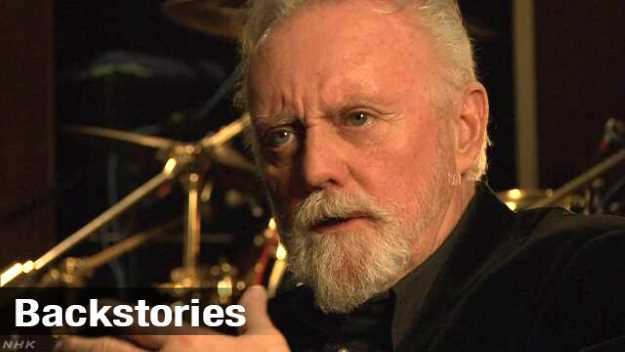 Roger Taylor Interview: "Freddie is always with me." "Bohemian Rhapsody", the new movie about British rock band Queen, is a blockbuster sensation, drawing huge crowds to theaters around the world. Focusing on the band and in particular its lead singer Freddie Mercury, the film has attracted casual music listeners, not just diehard Queen fans. NHK correspondent Akira Saheki sat down with drummer Roger Taylor to talk about the movie, Freddie, and the band's time in Japan. Q: Bohemian Rhapsody. You've been working on this movie for a long time. What were your thoughts after it came out? My main thought is that I am very happy that so many people like the movie. I think it touched people. This is all we really wanted, Brian and I, we just wanted the movie to tell a story, mainly a true story, not every detail and the time is slightly played with, but we wanted people to be touched and maybe to be uplifted a little. I think that's what it did. We wanted to make something where people felt great coming out of the movie. And we are very happy that the movie is popular. Q: What scene moved you the most? I think one of things that moved me most was Freddie's relationship with his father. I loved it when his father suddenly understood at the end that this was what Freddie did and he felt this huge pride. I think that's a great moment. Q: There's a scene, during the recording of Bohemian Rhapsody, when they ask you to go higher, higher, higher with your voice. Did that really happen? Not exactly like that because really when he was saying higher and higher, I was singing the same note but they were very high notes and I think I was the only one who could reach up there. But it made for a nice funny piece. Q: The movie is attracting new fans, teenagers, even people in their 20s and 30s. What do you think of this phenomenon? It is a phenomenon, it is great. I think it's fantastic to have a new public for us. We are an old band and we had great times back in the 70s, 80s and 90s. But now to discover in 2018, a lot of very young people really discovering our music for the first time, it's fantastic, it gives me a very good feeling. Q: What do you think attracts people to Queen? That's for people to say. I personally think it's good music, it has quality. And I think the musicianship is good, I think the singing is good and the composition is good. It may not be everybody's cup of tea, we aren't everybody's favorite style. But some of the songs have an anthemic, grand occasion kind of feel and I think that translates to people. Q: You said in an interview that you feel that Freddie's abilities as a musician are now being focused on. Can you elaborate on that? Amongst the other things, the theatrical elements of Freddie, his own private life and etcetera, they sometimes get exaggerated and people don't think that first and foremost Freddie was a musician, and he was a really great one. Apart from being a great showman and singer, he was a great musician and composer so we wanted to make sure that came over in the movie, not just the more salacious side, the side that some of the newspapers liked to write about, because they don't write about music. Music is for people to listen to, it's not for newspapers to write about. 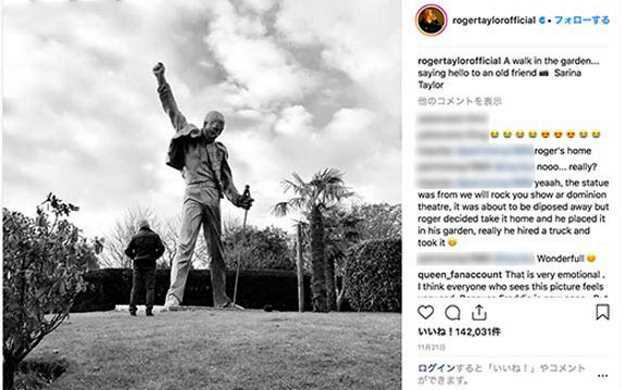 Q: Several months ago, you took a picture of a statue of Freddie in your garden. Can you tell us about the statue? I have a statue of Freddie in the garden, which I love, it's great, it's very big. I also thought it would be very funny to have the statue there and I think Freddie would have found it hilarious. He would have found it really funny. Q: What are the things that remind you of Freddie in daily life? Well, he's just part of the mental wallpaper, you don't forget him ever. He's been gone a long time but we never forget him, he is part of us. Brian and I, we always think he's in the corner and we think we know what he would think when we're talking. Q: The movie portrayed the sense of agony Freddie felt as an immigrant and as a minority, as a gay man. You were very close to Freddie when he was alive. Did you witness that agony and how he dealt with being a minority? Yes, I think he had a dichotomy. In those days, things were very different and everything was hidden. I think he felt great confusion. He had some very good looking girlfriends because he had a very nice way about him, so yeah, he was very conflicted and I think that's very accurate in the movie. Q: Do you think the movie provides people with a way to consider the troubles minorities face in society? I think so many people are in a minority of some kind, and I hope it resonates with them and gain some strength from it. There are too many borders and walls and cultural restrictions and I don't believe in any of that, I think we should think freely and everyone is different. Q: About Live Aid. In the movie, it's portrayed as something that brought the band together when it was on the verge of breaking up. We weren't really on the...well, we did come close to breaking up. But really Live Aid got us out of a period when we were bored and a little jaded. And I think it picked us up and reminded us that we were a good band and there was a lot of love for us out there in the public. So it gave us huge renewed confidence. Q: How was it when you were out there on stage for Live Aid? It was new because there was daylight, there weren't many lights and we were dressed in normal clothes. So we just thought, we better do a good performance, let the music speak for itself. And I sort of remember looking up and thinking, during Radio Gaga, they are loving it, this is going well, and then 10 minutes later, near the end, in We Are the Champions, I looked up and it looked like a cornfield, with everyone waving their arms and I just thought, "Yeah, this is going well. I think we've done well here." It was very satisfying. 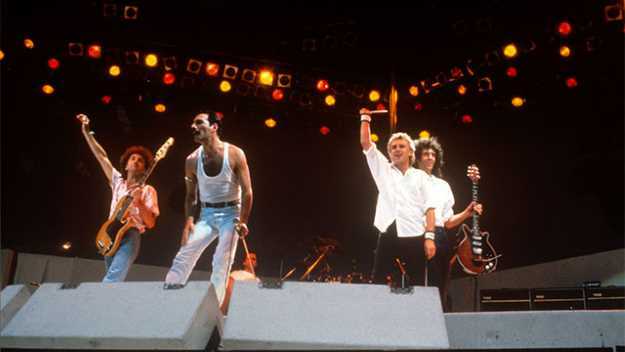 Q: One of the iconic scenes from Live Aid was the call and response between Freddie and the crowd. When did this interaction start? It started a little before that, a couple of years, when we realized there was a great empathy between the audience and the band, and so we always encouraged people to sing and interact with us. And Freddie became an absolute master of getting this interaction, so we all felt at one. When he sings "We are the champions", it's not us, it means we are all the champions. It is a great feeling of togetherness and that's what it's all about. Q: Where did he get the idea?. It was just something he worked out. It was just something he developed. He was very good, he had a very powerful command. He just worked it out and it was different every night. Queen at Live Aid on July 13, 1985 in London, United Kingdom. Q: In Radio Gaga, you mention how music changes through the years. How do you see the changes in music nowadays? Q: Radio Gaga was about the radio. This was an era when radio was turning into TV, and now it has turned into streaming. Yes, yes, true, it had. It seemed like MTV was huge everywhere in America. It seemed liked videos had taken over and become more important than the music. In fact, they cost almost ten times as much to make than it did to make the record. It just seemed like it was going the wrong way. And I thought, well, we fell in love with music through the radio, but then we went and made a great, big, expensive video, so I can't talk really. I love it, I think it's a great song. I don't know about favorite. It is difficult. We have a lot of songs I like and I wouldn't really put one of them above all the others. I do have a special fondness for Under Pressure because it was great fun and I loved everybody and we had so much fun and personal satisfaction making that record and it has something to say as well. Favorites, I have lots. Q: The movie is really popular in Japan, and Queen has been presented as a band with a deep connection with the country. Some people argue that Queen became popular in Japan first, and then in Britain and the United States. Can you set the records straight for us? It's tricky. In Britain, we became a bit popular and in America we became a little bit popular. But then when we went to Japan, and we were suddenly up here. And then we went back to Britain and we were up there too. But Japan was the first to really love Queen and go crazy for the band. We never forget that, the first time arriving at Haneda in Tokyo, it was incredible. The whole tour was like a dream. Q: Is that why you came up with Japanese songs as well? I think so but we loved the culture. Freddie was crazy, he would go to Tokyo just to shop, two weeks of shopping. Q: How many times have you been to Japan? That's a good question. At least ten or twelve times. Q: Do you go to specific places every time? I remember we did one tour, we went everywhere. We went to places like Kanazawa and lots of cities. And sometimes we'd just go to Tokyo and Osaka. I went once and did a concert with two of my heroes, Joni Mitchell and Bob Dylan. We did a concert by a big temple outside Osaka, that was fantastic. I think I did a song with Yoshiki. Q: What does Queen mean to you? The band is now Brian May and myself, and we have become closer in a way. We realized this is our life and this is our destiny and I think we enjoy it. We have this wonderful singer, Adam Lambert, who is a joy to work with and it's a beautiful combination. He is much younger than we are but it works. He is very intelligent and has the most beautiful voice. We realize now that this is what we do and we enjoy doing it while we still can. I don't know how much longer but right now we really enjoy playing and I look forward to our next tour, whenever it may be. This interview was conducted on 12 December 2018 at Roger Taylor's personal recording studio, in England. The transcript has been edited for brevity and clarity.